If you are looking for picturesque alleys, cute cafés, and wonderful scenery, Rosh Pina is the perfect place for you. Located in the Upper Galilee, this charming small town neighbours Safed, and with Hazor, they make a three-city attraction famous for their rich history, spectacular scenery, light industry (things like consumer electronics or the clothing industry. It's less capital-dependent and more manufacturing oriented), and tourism. Rosh Pina was founded in 1882 by 30 families who emigrated from Romania, and it was the first settlement in Israel under the Baron Edmond James de Rothschild’s patronage. Rothschild built a synagogue first, followed by houses and schools, and this is what we know today as the old, lovely neighbourhood of Rosh Pina and a town of some 3000 residents. Here are a few places in Rosh Pina you will be able to check out during an escorted tour. One of the structures Baron Rothschild built in Rosh Pina served as living quarters and offices for the clerks he sent to oversee the town’s finances. The Clerk’s House, also known as Beit Hapekidut, is now a museum that offers a multi-screen audio-visual presentation about the history of Rosh Pina and its road to becoming the lovely town it is today. The film is available in English, Hebrew, and Russian. While there, take a walk through the Baron’s Gardens, a small wooded area on the hilltop at the beginning of Rosh Pina’s original neighbourhood, with stone steps and flowers leading to the residential area. Also known as Gan Habaron, the garden was supposedly modelled on the Gardens of Versailles, designed by a French landscape architect and planted in 1886, with many of its plants brought from France. One of Rosh Pina’s landmarks is certainly the home of Professor Gideon Mer who established a malaria research laboratory in this town in 1929. Baron Rothschild gave him the property so Mer could find a way to treat malaria and help the afflicted people in the Hula Valley. Additionally, Mer served as the chief physician to the British forces in WWII, who also suffered from malaria. His work gained worldwide recognition for controlling the disease and stopping the epidemic among settlers in Israel and beyond. Today, his house is a national site where visitors can see an exhibit of historic items from various periods, such as laboratory equipment and textbooks, and even Mer’s private office, still preserved and with original furnishings. While taking a nice stroll through this lovely little town towards its historic center, enjoying the scenery and the relaxed Galilee way of life, you will certainly notice the enormous wind chime placed in a massive eucalyptus tree. This is actually an artistic symbol that marks the entrance to the Jerusalem Chimes. It is a studio, a shop, a workshop, and the artist-in-residence quarters opened in 1993, as the first and only of its kind in Rosh Pina. The shop specializes in wind chimes, and each has its own function. For example, some sounds help improve your sleep, while others have a calming effect on stressed and worried minds. You will also find many other hand-made wooden wind ornaments, such as stars of David, wooden ducks, or candle holders. 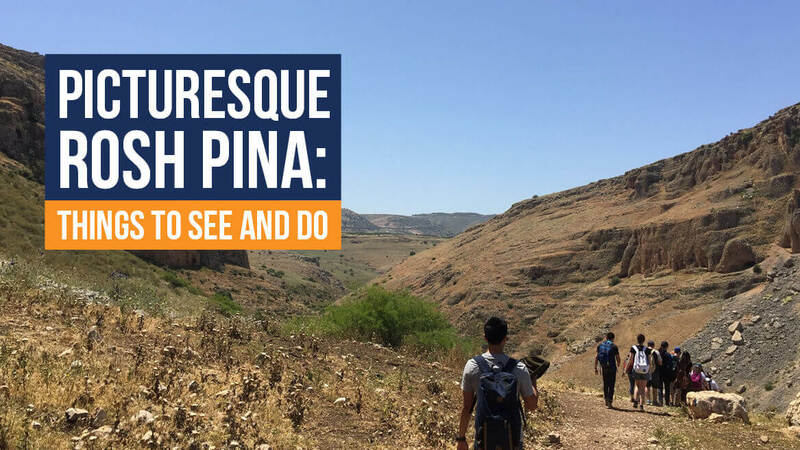 If you wish to learn more about Rosh Pina’s history, all you need to do is take a walk. Take the road between the houses and you will find the local cemetery and memorial for fallen soldiers. Just a bit further stands Rosh Pina’s synagogue – the town’s first public building – with its beautiful interior. Walk a bit further and visit Rosh Pina’s school, the first in the world to teach all subjects in Hebrew, and the one that set the standard for other schools in Israel. The school principal’s house on Founders’ Street was a cultural centre, which now houses an art gallery and a shop. At the uppermost part of the town, you will find the Nimrod Lookout with incredible views of all the magnificent mountains and ancient cities surrounding Rosh Pina. For a fragrant end of your walk, if it’s November, enjoy the flowering sternbergias and its bell-like blossom. Rosh Pina is a fantastic spot to base yourself in, as it is a gateway to all four sides of the world. Whichever path you take, you will end up in an amazing place. The main road takes you to the mountain and deep into the city, to the original neighborhood, while breathing pure mountain air and enjoying a unique view of the snow-capped Mount Hermon, Israel’s tallest peak. If you take the promenade-like path, you will see a number of sculptures and pictures of the early settlers. Furthermore, the beautiful Safed is just a few minutes’ away by car, the ancient Hazor is also close, the magnificent Sea of Galilee and the Golan Heights are just a short drive away, and nearby also rest the natural wonders of the Hula Valley and Horshat Tal.